In 2009 Antonio planted at the pond at the far end of our garden 3 Musa 'Nanição' that thrived very well and two became particularly strong and big. One bloomed for the first time in 2011 and formed fruits, unto the pondsidefortunately, the frost from June 26th, 2011 destroyed them, but the plants survived and recovered quickly. In the austral summer 2012/13 two of the three fruited again, and the crops were successful, but the fruits were not yet ripe before our departure, we were not able to stay in Brazil until the begining of March because of the new law for the residence of citizens of the Schengen area and had to leave on February 1st, 2013. So that the family of our housekeeper Antonio ate the fruits. We never had to water the bananas at the pond, the plants were only fertilized. Because of the trees in the vicinity of the pond the place is semi-shady to shady. Bananas are known as woodland plants. And the ground-water level is quite high by the pond and even in the dry season in the winter, watering is not necessary. 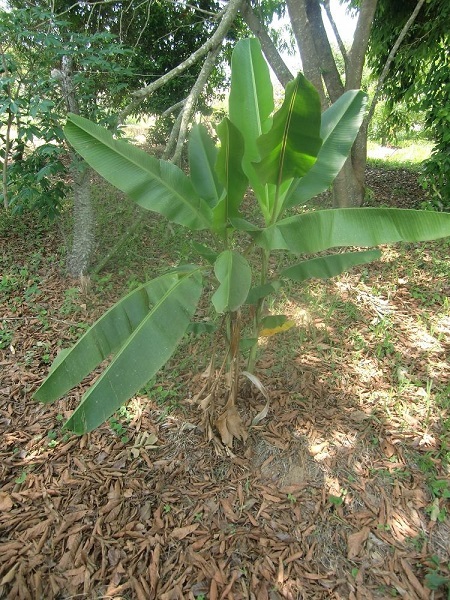 At first I planted Musa balbisiana, siamensis 'Thai Gold', formosana and ornata into the sandy soil at one sunny place and semi-shade, they did not thrive very well and grew only poorly, had always to be watered, fertilized and mulched. 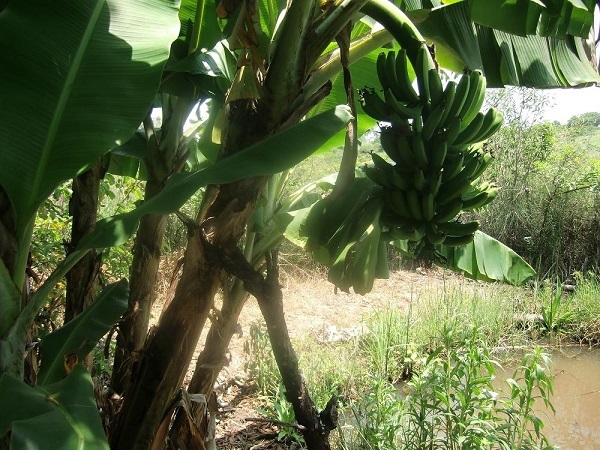 However the first three bananas at the pond grew very well with only few care, one idea came to me to transplant the affected bananas into the neighbourhood of the bananas which were planted by Antonio to the pondside. Also I tried to plant Ensete maurelii to the pondside, but it did not survive for long time, because too far planted at the end of the garden at the pondside where it is already a bit swampy. The three of Antonio are a bit away from the pondside where it is optimal for bananas. 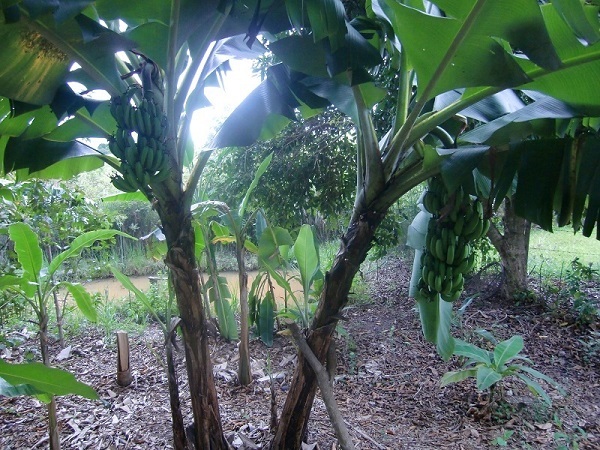 The poorly grown bananas grew more and more better and recovered, grew very well at the pond until today. Then I got from Helton Musa acuminata ssp. microcarpa, ornata x velutina 'Anestor', itinerans 'Indian Form', itinerans 'Burmese Blue', mannii, Ensete ventrichosum and other and planted them at the pond. 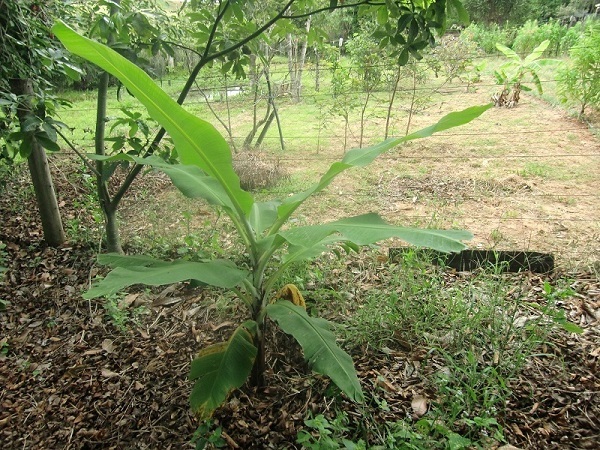 One Musa velutina had problems in the front garden despite of the red soil and I also transplanted it to the pondside and it began to recover. 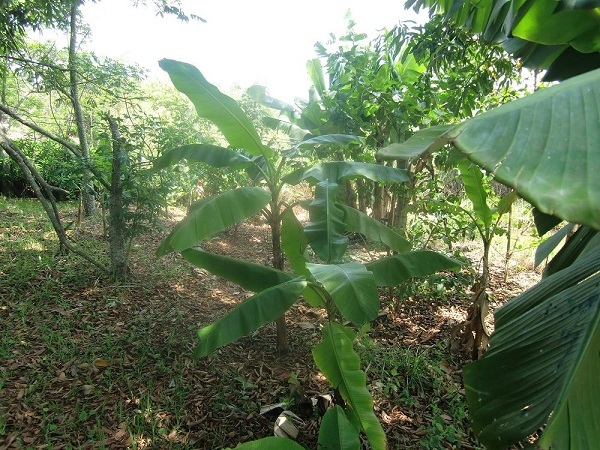 Also I could get 3 pups from my Musa basjoo at the vegetable garden of Antonio and planted them to the pondside. Óne large Bombacopsis glabra died by frost and Antonio cut the tree by the power saw and I removed the tree from my yard. 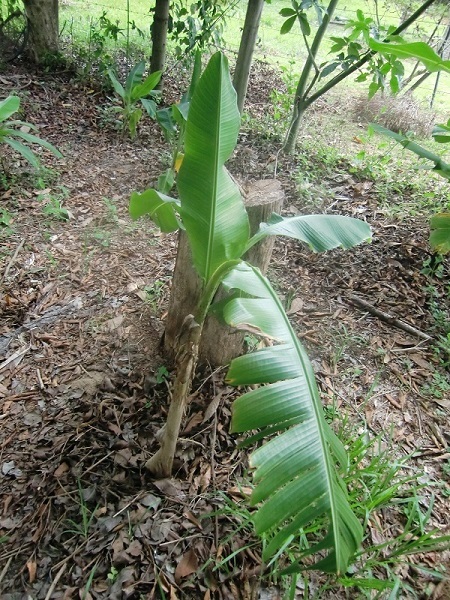 Now there is more place for more plantations, one poorly grown Musa acuminata ssp. zebrina I also transplanted to the pondside, it began to recover again. 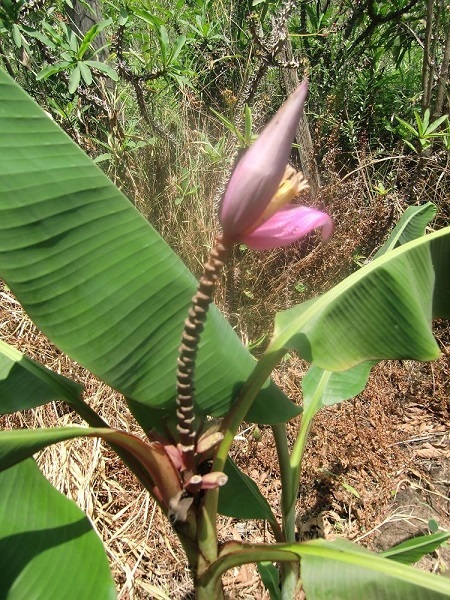 Because of more place Musa laterita, Musa itinerans 'Burmese Blue', Musa itinerans 'Indian Form', Musa 'Gros Michel', Musa 'Marmelo', Musa 'Abobora' and also pups from Heliconia sp. were planted on Oct. 26th, 2012, also one more pup from Musa acuminata ssp. zebrina. In the long term Musa 'Thousand Fingers', Musa 'Ice Cream' syn. 'Blue Java' syn. 'Java' and Musa 'São Domingo' will be added, with some luck Musa 'Praying Hands' too. Unfortunately Ensete ventrichosum is missed now, probably has died, the other both specimens at the vegetable garden of Antonio and at the house have survived the drought. that the bananas are thriving well there. totally at the right part partly to see one pup of Musa basjoo. Musa siamensis 'Thai Gold' at the pond on March 2nd, 2012. Musa acuminata ssp. microcarpa at the pond on March 2nd, 2012.
therefore was transplanted into the special garden, here the update from March 2nd, 2012. One Musa species, probably Musa acuminata ssp. microcarpa, at the pond on March 2nd, 2012. 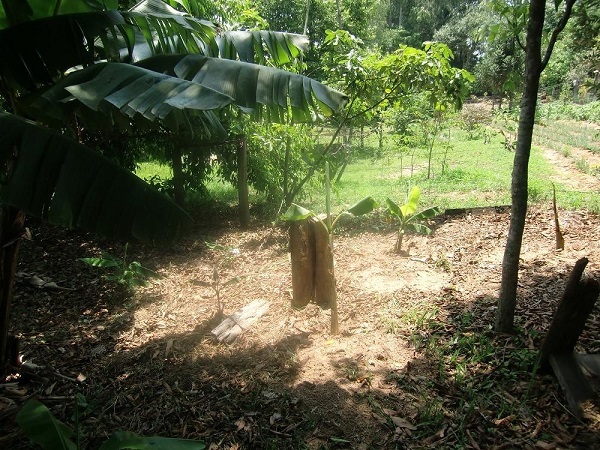 The special garden on October 28th, 2012, the bananas have kept well. Musa 'Gros Michel' and 'Marmelo'. First flower of the second specimen of Musa velutina on October 28th, 2012, at the pond. 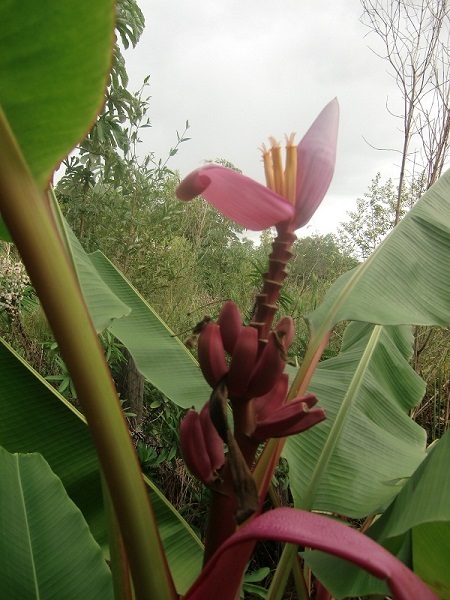 New fruit forming of Musa 'Nanição' after the frost from June 2011, update from October 28th, 2012. 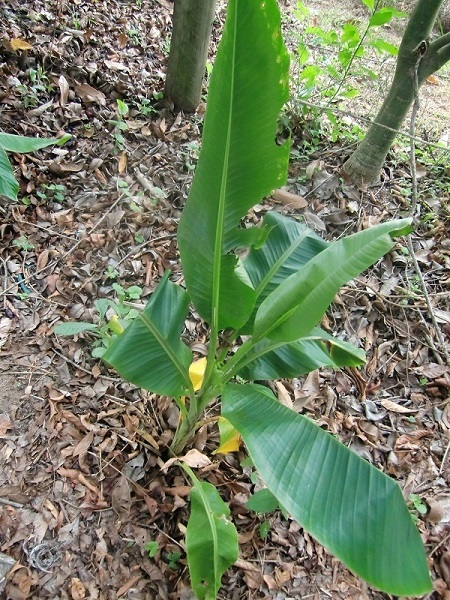 One second plant of Musa 'Nanição' pushed one inflorescence in December 2012. Close-up of the inrflorescence bud on December 9th, 2012. 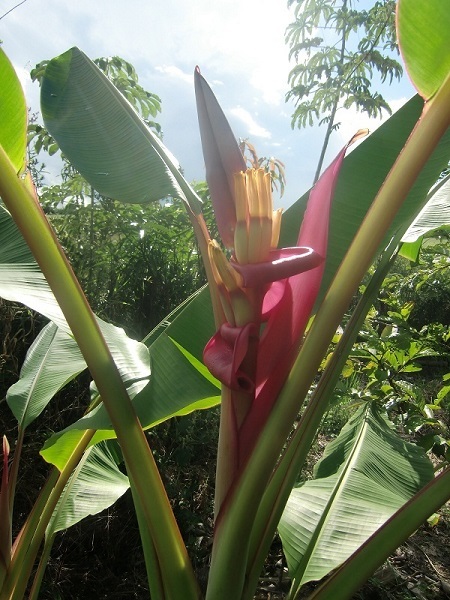 Second flower of Musa velutina on January 15th, 2013. The same inflorescence with formation of fruits on January 31st, 2013. January 31st, 2013, the harvest was for the family of Antonio. The rare Brazilian banana cultivar Musa 'Abobora' is grown on well, update from January 31st, 2013. 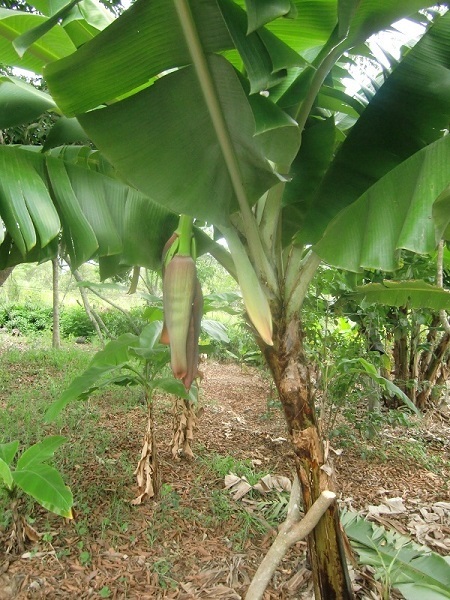 Also Musa 'Gros Michel' is grown on well and has no problems, update from January 31st, 2013. 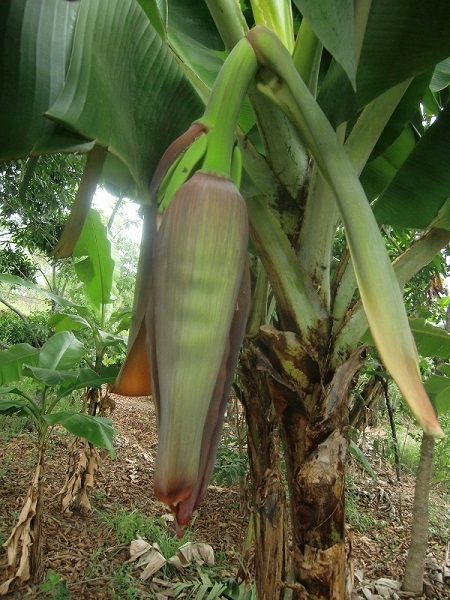 At the same Musa 'Marmelo' is grown on well, update from January 31st, 2013. 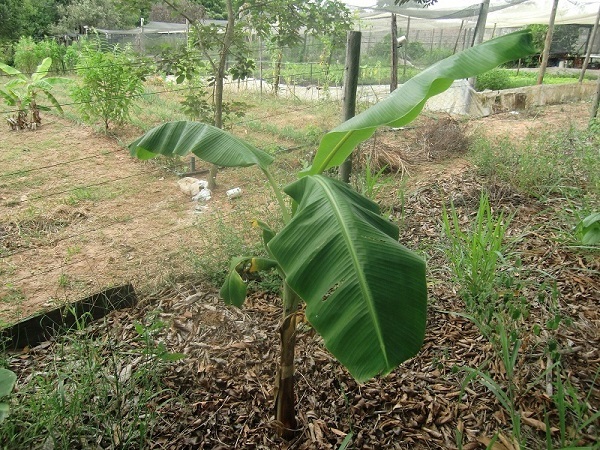 Musa laterita has developed well in the special garden, update from January 31st, 2013.